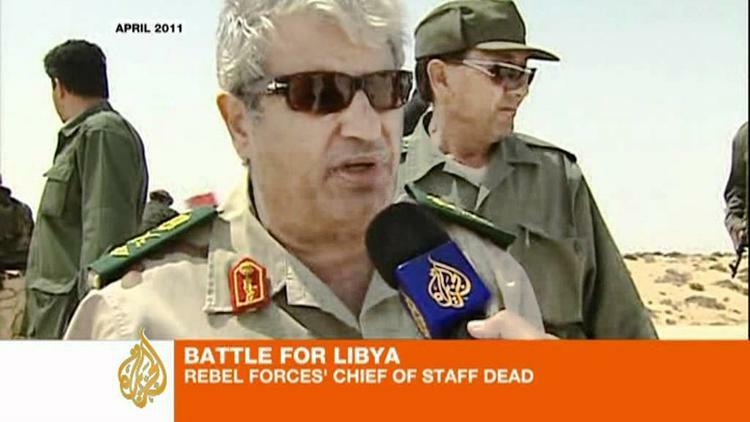 Abdel Fattah Younis, military leader of the Free Libya Forces, was assassinated Thursday. Younis was too close to Qaddafi, despite his defection, to remain truly popular with the rebels, and it is a little unlikely that his death will affect the terms of the uprising, despite what some observers are saying. He was not allowed to be a field officer because of the mistrust, so his absence would not affect the battlefield. In fact, the hardy Free Libya forces of the Western Mountain regions took a strategic town near the Tunisian border as news of his assassination was announced. And, Brega, though being cleared of mines, has fallen to Free Libya forces in the east, a major advance for the rebels. Western observers keep looking for a stalemate, but the rebels have in fact steadily advanced. Aljazeera English is even reporting that Younis is accused by some of having been a double agent. I have no way of knowing if the allegation has any truth to it, but obviously if it were correct, then that would affect how we should interpret the news of his demise. On the other hand, Mustafa Abdel Jalil, a leading figure in the Transitional National Council and also a defector from the Qaddafi regime, issued a statement blaming a small armed cell for the assassination and said one had been arrested. Benghazi will now ban the carrying of arms inside the city. Abdel Jalil is clearly afraid that the Obeidat tribe to which Younis belonged might be angered over his death and desert the rebel cause, and went out of his way to reassure them. (In the interests of TNC unity, it is a better story that Qaddafi loyalists got through to Younis than that he was taken out for being a double agent).